Bushfires in SW Western Australia are a natural occurrence and to be expected from October to April. Of themselves if not hugely intense they have a role in the regeneration of the vegetation, they recycle nutrients and remove dead and dying plant material to make way for new growth. Problems arise when bushfires meet people or property. In the past forty years or so many people from the cities and suburbs have sought a home in the country either as a holiday home or as a permanent place to live. The sea change concept applies to coastal living, the tree change to those who wish to live closer to forests or woodlands. “Tree changers” will often have a romantic view of the bush. Unless they have had experience of living on a farm or near bushland they may be unprepared for living in a safe way in fire-prone areas. In fact if a bushfire comes close it may seem more like a war zone than a peaceful country home. See my recent letter to the West Australian, published on the 13 January 2015. The link is to a pdf version. Letter published in The West Australian, the daily newspaper of the state of Western Australia. In any bushfire that comes close to settlements there will be some disruption of daily life. Power will often go off, sometimes for hours or even days as in the recent case of Northcliffe which is still being restored. Power is needed to operate pumps where there is no scheme water, so water supply can be affected just when you need it most. Circumstances may indicate that it is better to evacuate to somewhere else whilst the bushfire is active. Then there are problems with respect to pets and to livestock including those half a dozen hens that are almost pets that scratch around the yard. With no power for a day or more, the contents of freezers may well be not fit for consumption. Who can you stay with? There may be no likely candidates at short notice. A plan can be useful but it does not disguise the fact that normal life has to be put on hold. There is also the possibility that the house may be burnt down with most of your possessions destroyed. 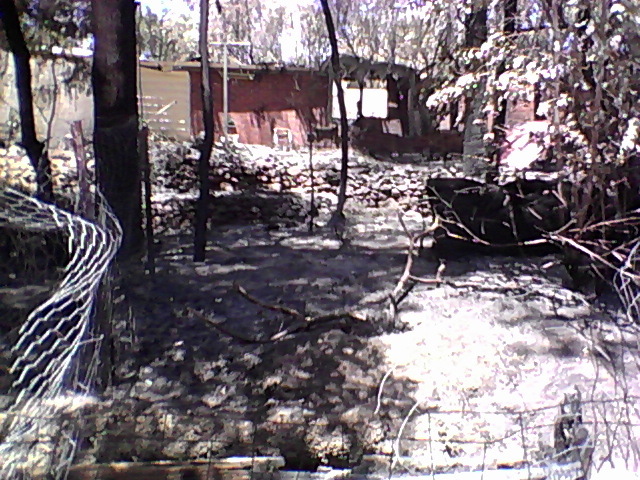 After the fire at Parkerville, Perth Hills, January 2014. 57 houses were destroyed by fire.